With football season comes wings — and these honey lime hot wings are where it’s at! I mean, football Sundays just aren’t the same without hot chicken wings. Am I right, folks? I’m not sure how you like your wings, but I love mine hot. And with a whole lot of lime! These hot honey lime wings have the perfect balance between spicy and tangy, plus they are baked and not fried. Which is exactly why am so excited to be sharing this delicious recipe with you. Being a part of a big Mexican family we are used to eating spicy food — duh! It seems as though just about every meal is served with some sort of hot sauce, limes and probably a corn tortilla. When I found out about having the chance to try all three flavors of the new Don Victor® Hot Sauce I was so excited. It’s all about the little things in life. If you have yet to hear about the new Don Victor® Hot Sauces, let me fill you in. With three new flavors of astoundingly hot Piquin Pepper Sauces, Don Victor® will elevate your taste buds to the next level. Though piquin peppers are small in size, they’re huge on hot, making jalapeno peppers look timid by comparison. The piquin pepper is a very small pepper from northern Mexico. Don Victor®’s sauces are the only ones you will find on the market that are made entirely from this pepper. Given my long love affair with hot sauces, I was more than confident I was ready for what the Piquin Pepper Sauces were ready to throw at me -like no other sauce out there. I used Don Victor® Extra Hot Piquin Hot Sauce, but you could try the Don Victor® Red Piquin Red Piquin Hot Sauce or the Don Victor® Green Piquin Hot Sauce. All of which are delicious. Preheat oven to 400F degrees. Line your baking sheet with foil which makes for an easy cleanup. Top your baking sheet with an ovenproof baking rack and spray lightly with a nonstick cooking spray. Mix all rub ingredients in a small bowl. Add half of the rub into a large freezer bag. Throw in half of the wings and shake until evenly coated. Place wings on the prepared baking rack making sure they are not touching. It might be a tight fit. Add the remaining rub ingredients and the rest of the wings to the bag and repeat above. Place in oven and bake on an upper or middle rack for 45-50 minutes. Once the time has passed, place the oven rack approximately 8″ or so from broiler and turn oven to broil. This is done to ensure desired crispiness, but be sure you’re watching closely so they don’t burn! If desired, flip chicken wings over and broil the other side until crispy. Set wings to the side to cool. In a small saucepan, melt the butter over medium heat. Stir in remaining sauce ingredients and bring to a boil. Reduce heat and simmer until sauce slightly thickens. Dip a finger and do a little taste test. Add additional hot sauce for a spicier sauce or more honey if you like your hot wings sweeter. Add the chicken wings to a large bowl and gently toss with honey lime hot sauce using a spatula. You could also serve it as a dip! Don Victor®’s Red Piquin Hot Sauce – Ingredients: Red piquin pepper, water, carrot, apple cider vinegar, garlic, salt, oregano, preservatives. 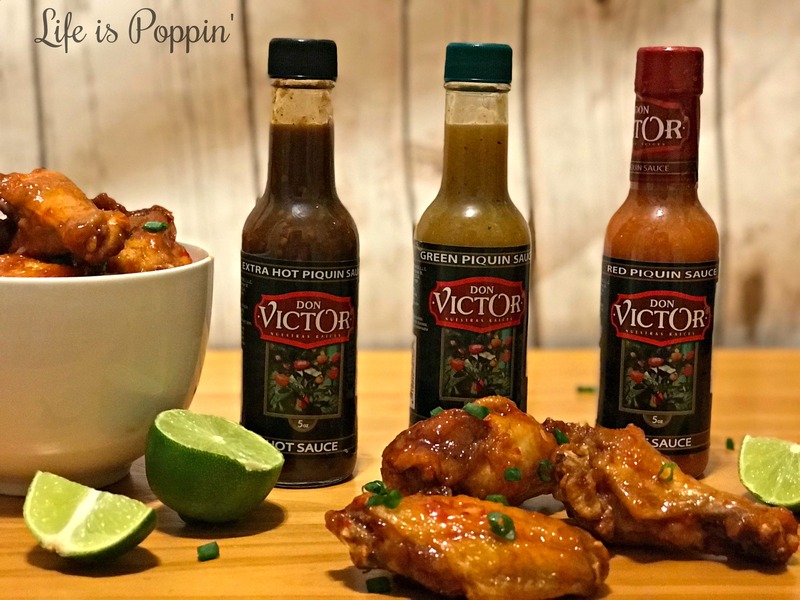 Don Victor®’s Extra Hot Piquin Hot Sauce – Ingredients: Roasted piquin peppers in olive oil, water, oil, garlic, apple cider vinegar, salt and preservatives. Ready to stock up on your own? Click the link below to visit DonVictorFoods.com! Be sure to check the condiment aisle of your local grocer very soon. To stay up-to-date on all things Don Victor® Piquin Hot Sauce, be sure to check out their Facebook page. Authentic tastes and impeccable quality are always on the table with Don Victor®. I’m in love!